A user is casually searching the web for a place to buy a gadget online. He/She types in “iphone for sale philippines” in the search box. The search engine fetches and retrieves a list of indexed websites offering such. Now, imagine your site be shown on keywords relevant to your niche and see your business listed on top of the Search Engine Results Page. From a marketer’s point of view, increased awareness could equate to increased sales. Establishing an online presence could gain you this benefit. But how exactly? This is where keywords become relevant and crucial in your marketing strategy. In Search Engine Optimization context, keywords are particular word or phrases that best describes your site with the intent of being found by your audience called “search queries”. To be found, you should create a content that speaks well with your target audience, let say know their language, culture, and start from there. The idea of ranking for certain keywords is to establish your site to your niche and drive organic traffic in the site. Organic traffics are users visiting your site after a search query by clicking your organic listing in the search results. Once your site is well established on relevant keywords, your pages will start to appear on the search results. But the process boils down on choosing what you should be targeting as there are two types of keywords: short and long tail keywords. Short tail keywords are what are also known as “head terms”. They are basically 1 to 3 words typed in by user to either search for a definition of a word, read an article about it, or other broad research purposes. The results are collective which makes it a unprofitable target when it comes to SEO. That, and you’re competing with referential websites like Wikipedia. Long tail keywords are keyword phrases with more than 3 words focused specifically on what you offer with lesser contextual competition. As an advertiser, focusing your efforts on long tail keywords could deduce a better a searcher’s intent and make you be found on more specific keywords. There’s no doubt short tail outweigh long tail when it comes to volume. Number of searches of short tail are higher due to the collection of unspecified focus. Long tail searches might lose this round but it will fight back on later categories. Long tail competitions are lower than short tail due to the particular keywords being optimized. While long tail competiveness is only limited to competitors or other local search entities which, in SEO, is more achievable, and there profitable. Achieving an established position for a low-competition, long tail keyword could prepare you well for the years to come. The search engine fetches and retrieves websites that sell iPhone and are in the Philippines. The focus of the search was funneled down to the need of the user thus showing only relevant sites. Being seen on long tail keyword search queries gives you a higher chance of converting views into sales. Expected results for short tail keywords is never guaranteed due to the high competition. Establishing your site for short tail keywords could take years and the results do not last long because of superior referential competition. Long tail keywords have lower competition so the cost for optimizing the site will be lesser and will gain positive results and website metrics in a matter of months, maybe even achieving desirable SERP positions in a year. If you’re going to run a PPC campaign, expect comparatively more expensive cost when targeting short tail keywords. Opting to target long tail keywords are cheaper and only appear on top of the search result to users who are ready to purchase. Short tail may bring in increase in views and users, but the conversion could be underwhelming. Let’s say a chosen short tail keyword has 10,000 searches per day and gains you 100 clicks; this then yields you 1 or 2 customers who make a purchase. That’s about a 1% visitor conversion rate. Why is that? Because users being broad on their search query are also the least likely to already know what they want. There is no doubt that the longer the keyphrase, the higher the conversion rate. User’s being specific on their search query have done their research and have the mindset to purchase. 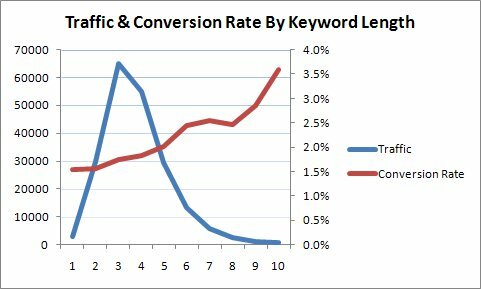 Targeting long tail keywords also guarantees you decreased bounce rate and increased conversion. Short tail keywords still work for big businesses with a website that have relevant & niche-rich content, established domain authority, and strong branding—if this is not you, optimizing for long tail keywords is your best profitable bet. Long tail keywords may have low volume searches but they promise higher conversion rate, lower cost, and lower competition focused mainly on what you offer. But the decision is still up to you: know your business, define what you offer, and see what fits best to your needs. Perhaps giving us a tap would help you decide. Remember to choose wisely! « Don’t let these Local SEO opportunities haunt you Forever!